Revenues at Boston-based global athletic company New Balance soared to almost $4.5bn last year and the leadership has ambitious plans to reach $7bn by 2023. CEO Robert DeMartini and VP of Global Marketing Chris Davis explain the journey as a successful challenger brand and the thinking behind 'Fearlessly Independent Since 1906' - its new global brand platform. How do you see New Balance as a challenger brand? ROBERT: We've always been contrarian. That's what the owner Jim Davis built this business on. As a private company, we can make a decision based on a five or ten-year period. In today’s business, a lot of companies can't do that or won't do that, and that's a theoretical debate that’s irrelevant to us. We do what we believe is right, whether it’s popular or not. That's part of what being a challenger is all about. CHRIS: It’s funny because consumers love challenger brands, but associates and people in general, they don't want to take risk, and they're afraid of failure. So, one thing we’ve adopted within the marketing department, and really, what we’re trying to encourage associates all over the world to do, is to make mistakes, take risks, to fail, and to learn from that. A common phrase that people use within our organisation is that we ‘look, feel and act like a 110-year-old start-up’. We act quickly, but make sure everything we do is authentic to the brand. We’ve introduced a model called 50/30/20, where we’re using 50% of our budget to capitalise on what we know works, 30% to be a slight evolution, and 20% to be on high-risk, uncharted and innovative territory. Can you share an example of where you've made a decision you believed to be right for the brand that perhaps wasn't popular? ROBERT: Domestic manufacturing is the most significant one. We have five US factories and a sixth in the UK. We employ more people making shoes today than at any time in our history. If you're a public company you do the math, see domestic manufacturing is more expensive... it just wouldn't happen but we do it because we believe it’s the right thing to do. We’re participants in the communities that we place our factories in, and we’ve got a commitment to the workers in those factories. We also believe it allows us to respond more quickly to the consumer. CHRIS: From a marketing standpoint too, we believe our marketing is a reflection of our values so we have to do the things that matter most to us. Whether that's made in the USA, or us ensuring that a portion of every contract we have with a player or a team is given to charity. It’s about putting our money where our mouth is. 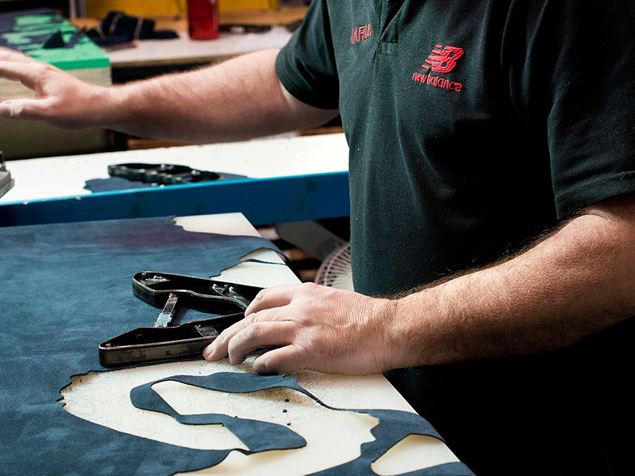 A worker in New Balance's UK factory in Flimby, Cumbria. How has taking a challenger approach helped New Balance? CHRIS: Over the last five years, acting as a challenger brand, we’ve really gotten our swagger back. There's really no other way to put it. We now have this sense of confidence that we can really conquer anything, whether it’s putting our stake in the ground to being the world’s best running brand, entering baseball and having success, having the audacity to enter football or entering basketball next year. There's an unprecedented level of confidence that we have now and I think that's going to lead us into doubling again in the next six to seven years. What was the business case to first change to a challenger strategy? ROBERT: We weren't growing. We were at a period in 2008 where we had a malaise in our running business, and we were 5th or 6th in the ranking. We’d come off a lifestyle run that had propelled the business from below $1bn, to about $1.5bn, but our performance product was not great. I personally didn't see it right away, but people that really knew the product knew that we could do much better. What were the steps in getting the business to where it is today? ROBERT: We did some strategy work with eatbigfish and a phrase that came out of those sessions was 'Move the World.' We talked about the fact that we were an athletic company, interested in not only getting people running record-setting marathons, but just getting up off the couch and being more active. We’re not just making shoes and shirts, we’re getting people active. The company you see today was really grown out of that idea. We also evolved the language of our strategic direction to became the world’s best running brand and a top three athletic brand. That's recognising that Nike is eight or ten times bigger than us, and Adidas is five or six times bigger than us, but after that you realise you're in an unbelievable position to be a clear number three. And shortly after working with eatbigfish, we started to engage athletes again. And I remember when we first put that language out about becoming the world’s number one running brand, I could see in people's faces, they didn't believe it. It was a belief that was alive and well with the ownership, and people that had been here a long time, but the rank and file weren't sure we could win. We had to convince people. And it took probably five years before it sunk in. Today, when you use that language in the organisation, there's people that think how soon are we going to get there. But, I don't think there's any doubt of whether we will or not. It took measurable and steady progress and an unwillingness to change the goal. That's what got the engine started. NB's Global Headquarters in Boston. Photo courtesy of New Balance. What did you do to convince people in the organisation you could achieve those bold ambitions? ROBERT: The running challenge was about taking modest steps of accomplishment. In 2008, we sponsored one significant marathon, the Chicago Marathon, and it was expiring. We debated, internally, as to whether we should keep it or not, and we chose to step away. A decade later, we now have the New York City Marathon, the London Marathon, and while we don't sponsor the Boston Marathon, we guerrilla market around it. So, our brand is front and centre at the three biggest marathons in the world. We couldn't have got there in one step, we had to take those steps of confidence. Importantly, those investments got our people and our partners to believe that we could become number one. CHRIS: When we first decided to get into baseball, we were doggy paddling in a lot of different sports. We were in cheerleading, volleyball, American football, I think even field hockey, at one point. So, it took saying no to all of those things and really focusing our energy on baseball. Five or six years later, we’re number one in baseball. And that really served us a beta test of other sports, for the organisation. So, finding that proof point, and then making it uniformly replicable across all other sports that we were going into. ROBERT: We’ve grown from $1.5bn in 2008 to $4.5bn in sales in 2018. That's the reflection of 8000 global associates working their tails off to become the number one running brand in the world and a top three global athletic brand. A decade ago we were a wholesale company. We were 98% wholesale and 75% North America. We operated four or five stores around the world. Today we’ve got 350 that we own and 3500 that we run through partners. We’re now 12% e-commerce. We were zero back then. Now, that's a trend that’s bigger than us, but that's a whole muscle set we had to build. We had to carve that out from our historically good businesses to get these things started and someday that may be half the business. CHRIS: That took a ton of risk for a company that was doing fine. It took operational investment, it took strategic alignment across the world. I mean we built an e-commerce engine, 3000 stores in China and eight flagships on major international high streets all over the world within five or six years. A lot of that was risk associated with being a challenger brand. Six or seven years ago, people thought those investments were crazy for taking money away from investments that were already working. "Fearlessly Independent since 1906". New Balance's global brand platform Credit: New Balance / VML. Tell me about the journey that got you to the current expression of the brand as Fearlessly Independent Since 1906? CHRIS: I think most brands are looking for the next new catchy marketing campaign. But being a challenger brand, we wanted to find something that was severely authentic - something undeniably New Balance. It was more about revealing our brand truth. Over the course of four or five months, with internal and external interviews and workshops, we landed on the notion of 'Fearlessly Independent'. It not only dictated where we wanted to go as an internal rallying cry, and what we wanted consumers to know about us, but it was also a great reflection of our past 110 years and how we got to where we are today. That's our North Star, that's our ethos – Fearlessly Independent. What has been the most shining signature example of the brand being 'Fearlessly Independent'? 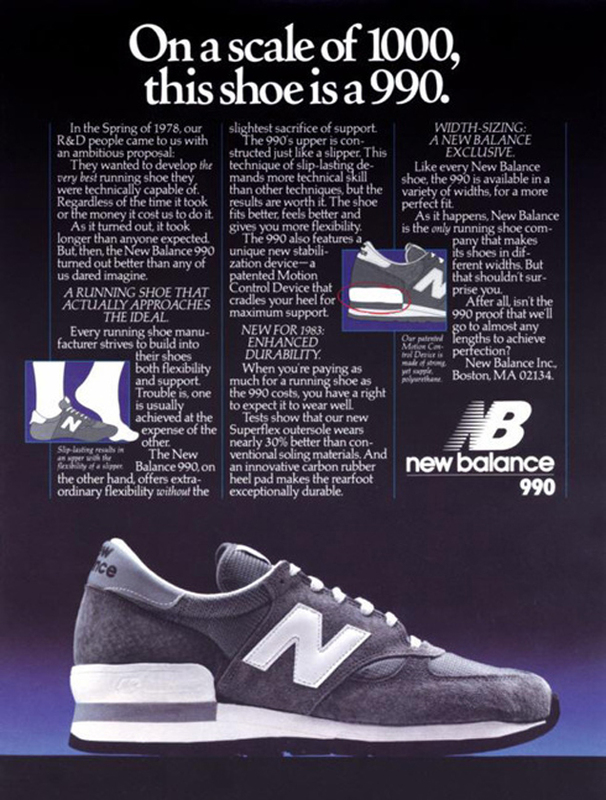 CHRIS: When we first released the 990 in 1982. It was the first running shoe above $100, it was made in the USA, and at a time of brightly coloured shoes in the marketplace, this was all grey, specifically designed for running in the city. The marketing campaign was: 'On a scale of 1000, this shoe is a 990' so really poking the competition and being bold and disruptive. The 990 campaign from 1982. Image courtesy of New Balance. ROBERT: When we first started pushing the Berry Amendment in trying to supply footwear to the US military. The Berry Amendment has been in place since 1941 and it requires the Department of Defense to give preference to US manufactured products. Up until recently athletic footwear was the only category on a soldier’s head to toe that was not using an American made product. There was a waiver in the system, and the story of why is debatable, but probably because some of the biggest companies in the industry didn't make shoes here so they had been able to get around that. We said this is wrong, we’ll make the footwear here. This is something we believe in deeply. We’ve supported it with our actions, our investments and we’ve supported it with our commitment to those people. It took us seven and half years to win the contract, but we did it. What advice would you give to someone aspiring to build a successful challenger brand? ROBERT: It really comes down to three things: truth, trust and time. Truth means: Do you know who you are? If you don't know that as a brand, you're not going to have the North Star to tell you what’s right and what’s not. Trust. Are you credible in that space? And finally, time. You've got to move now. You've got to take those risks, whether you're ready or not. CHRIS: Nothing great ever happened from playing it safe. You have to be able to make mistakes and learn from them. My second is recognise that you might not be as big as your competition, but you can be smarter, and that requires finding a common goal and attacking the competition where it hurts. And finally, make sure that your brand is transparent and purposeful. Stay true to your brand and those values.